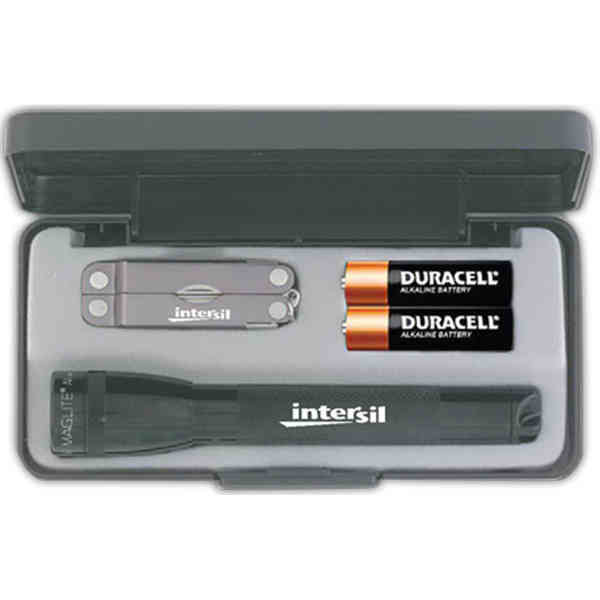 Combination set includes a 5 3/4" flashlight with a textured center grip and a multi-purpose tool with a 1 5/8" stainless steel blade and 2 1/2" stainless steel handle. The 100% stainless steel multi-purpose tool weights 1.75 ounces and is 2 1/2" closed. Number one selling multi-tool. 25 year warranty on multi-tool. Features clip point blade, nail file/cleaner, tweezers, inch/metric ruler, bottle opener, extra small, small and medium screwdrivers, Philips screwdriver, key ring loop, and scissors. The flashlight easily converts to freestanding candle mode by removing the barrel head and reinstalling it as the base. Life time warranty on flashlight. Colors may vary. Price Includes:flashlight laser engraving running charge first location and knife blade etching running charge. Imprint Size:1/8" x 3/4", 1 1/2" t x 2 1/4" w, 3/16" x 1 1/2"